One of the things visual art offers is so fundamental, and so obvious, that it is often overlooked in discussion of the topic: it teaches us love of sight. A determined painter may spend years on twin studies - externally, the study of how some subject looks - and internally, the study of how the painter him- or herself sees that subject. When this study reaches fruition, the painter achieves a profound insight into seeing and what is seen. If the painter has developed commensurate skills of representation, then he or she can convey this insight. The beauty and soulfulness of literally anything under the sun may be revealed. The viewer is transfixed by the work. The deadened texture of the viewer's ordinary visual life slips away, and the world itself is revealed to be like art: unbearably rich in meaning and reward, in its tiniest detail so much as in its broadest sweep. Three painters have current shows demonstrating this mechanism - although if you like what I have to share here, sprint to Gregory Mortensen's solo at Arcadia Contemporary, I didn't have a chance to write this article until now and his show is about to close. At a thematic level, Tony Curanaj's still lives involve a species of visual humor conveyed in puzzling or wry juxtapositions. I am going to pass over this matter entirely, because I am almost totally tone-deaf to this kind of humor and can stare at it all day without getting it. 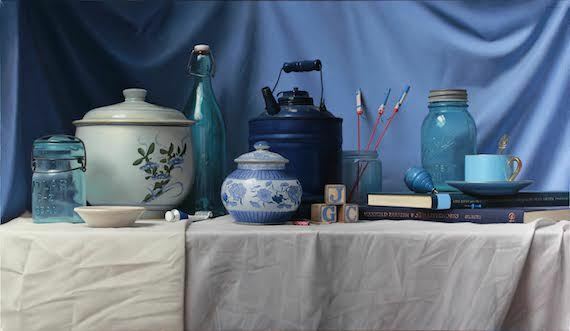 Tony Curanaj, Kind of Blue, 2014, oil on linen, 21.5" x 36"
Consider the calm, clear light which drapes this scene, giving brilliance to the highlights and yet leaving rich darks in the darks. Consider the sober intensity of respect this painting holds. In seeking to understand and convey the subtleties of the scene, Curanaj expresses his respect for the integrity of these objects - and his respect for himself, as someone called to see closely and to describe what he has seen - and his respect for you, his viewer, in presenting to you the absolute best that he is capable of. Consider the blue jar on the far right, versus the turquoise jar on the far left. The jar on the right is clear, while the glass on the left is clouded. How do we know? Because there is greater contrast and deeper darkness to the jar on the right. Where it curves away from us, and refracts the dark edges of the scene, they stay dark. The jar on the left is brighter than its background, because light scatters off the hazed glass. The edges glow because the depth of hazing is thicker there. We can practically feel the slightly scummy texture of the interior surface of the jar. Curanaj teaches us a lesson here. It looks simple: how do we know the degree of transparency of glass? But the answer is not simple. In studying his painting, we learn how we see what we see. Invigorated by our discovery, we turn to the real world, of real glass, and see each piece of glass anew, unique, specific, returned from a vague world of categories to a precise world of vivid experience. In every piece he paints, Curanaj refines his perception of simple things, so that they become precious, so that they yearn to be seen and so that the seeing of them is like a benediction. 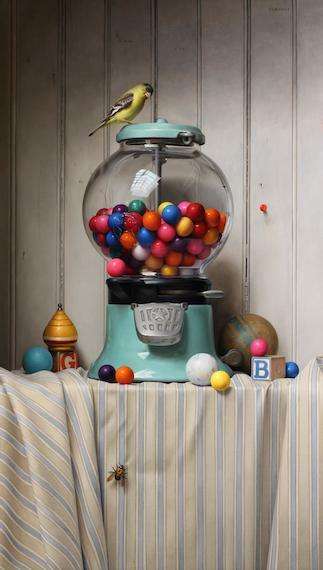 Tony Curanaj, The Gumball Incident, 2015, oil on canvas, 28" x 15.5"
Now we refocus our eye from the very small and nearby to the larger medium distance. Lisa Lebofsky prefers to paint wilderness, so she immerses herself in nature. She has sought out unpeopled land and ice and sea in Antarctica, Newfoundland and Labrador, Greenland, and the Maldives. Her technique is immersed in nature as well; though her paintings are representational, she has patted grass on them, and dipped them in water, and sketched them lightly on metal, all in an effort to merge her hand with that of the world. None of these biographical and technical notes can be clearly derived from her work, and yet there is a panoramic sense to it informed by all the habits of its creation. The work immerses the viewer in nature as well. Lisa Lebofsky, Fort Tilden - Long Island, 2015, oil paint on aluminum, 40" x 25"
If Curanaj summons a sense of touch, for me Lebofsky's new work invokes hearing. How specific a set of sounds one hears in this painting - the rising rush of the distant incoming wave, and the gurgle of the nearer receding wave falling back past the rotting wood, and the low hissing of the foreground sand as flowing water drags it along the beach. Notice how much more stylized this painting is than Curanaj's: the detailing of the sea is eccentric and reduced, the wood posts nearly graphic in their simplicity, the sand and sky mere swatches of color. Lebofsky's treatment of landscape is realistic, but it is not that of a realist. It meets sight at the stage of recollection, it presents what we remember seeing. This is why it is so closely linked to sound: this sight always goes with that sound. We are not seeing something new here, but recovering what we have lost about experiences gone by. Encountering Lebofsky's work returns the brights and darks, and winds and smells, of days alongside the vastness of the sea. 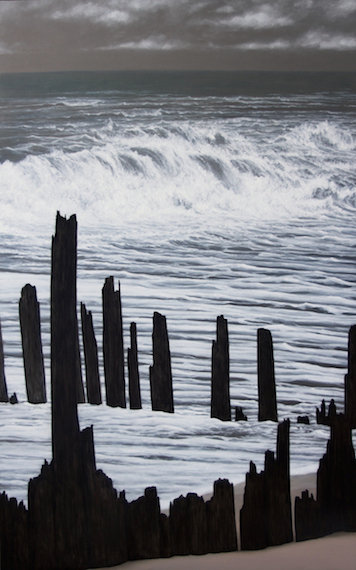 Lisa Lebofsky, Incoming Surf - Montauk, 2015, oil paint on canvas, 42" x 48"
Here Lebofsky's treatment of the water is more detailed, more strictly realistic, but her composition, with its serrated rows of waves and its absent horizon, is more stylized. It is the visual equivalent of the closeness of water when one is swimming in the sea. The entire landscape one sees is quite nearby, one's head too low to make out distances. Lebofsky finds here something that looks almost like the sound waves that accompany it. 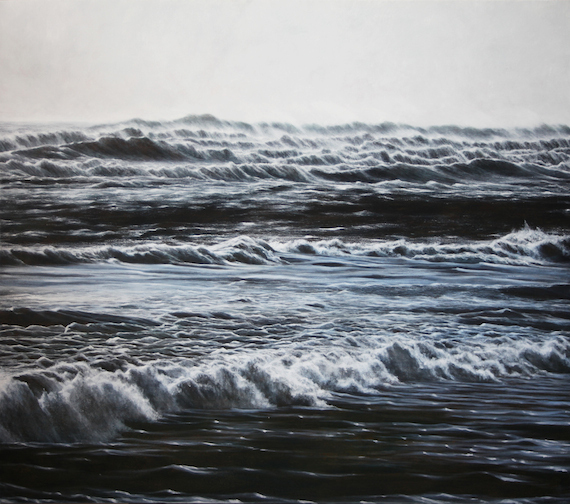 Her love of sight focuses on the nearly geometrical abstractions of the many moods of water; she lovingly captures the abrupt and shocking darks of troughs in the water, and the chaos of foam, and the coarse decay of the edges of little waves, where the wind whips spray off them into the air. 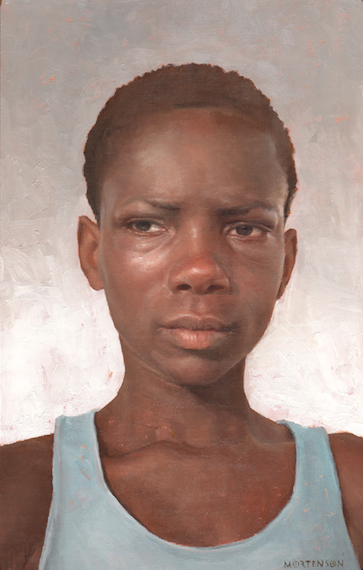 And finally, we have Gregory Mortenson's portraits of displaced children he met in Haiti after the earthquake, when he traveled there to help rebuild a school (proceeds from this show go to the same overall effort). He depicts them with a delicacy and empathy which pluck them from their time and place, and lend an eternal presence to them. 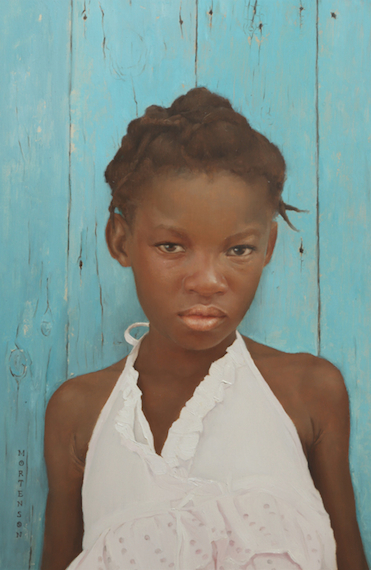 Gregory Mortenson, Blue, 2015, oil on linen, 18" x 12"
This is a little girl, her top a bright white, her brown skin almost orange against the faded aqua paint of the wall behind her. Her skin varies in texture from the shiny, slightly sweaty features of her face, to the soft matte of her arms: we understand this because the highlights on her skin vary from small and bright, to large and dim. But this is not what we think about particularly with this painting, because it is very much not about these parts, though the parts are of necessity well painted. Rather, they serve the central idea - the idea that here, sight confronts a thing that looks back. This is a painting of what we see and how we see, but in this case we see a person. Our powers of sight therefore eclipse themselves. They teach us things we do not know we learned from seeing: that this girl is tough, that she has been through a lot of trouble and come out of it still capable, with the resilience of childhood. That she is sharp and suspicious and weather-beaten. All these things we immediately take in, looking at Mortenson's painting. And we think, well, it's a beautiful portrait. But before it was a portrait, it was the farthest step Mortenson had reached in his own lifelong discipline of learning how to see. Gregory Mortenson, Boyhood, 2015, oil on linen, 14" x 9"
Ask yourself, how do I know this boy? You know him because you understand the furrow of his brow, and the way his eyelids drop a little bit, and the tightness at the corners of his mouth that is dimpling his cheeks. These are the signs which allow you to interpret his mood and character. You may try to apply the lessons you learn here, as one might apply lessons from Curanaj in the study of glass. But you will most likely forget those lessons very quickly. Our eyesight is designed to see humans, and we gain most of our information about them from sight, and yet our conscious minds are nearly blind to them; blind, because they are everything to us, and their familiarity and omnipresence blinds us. Mortenson's love of human beings has led him to excavate the machinery of sight, as all serious portraitists must, and so he too teaches us the means of seeing, and what we look to see, and the sheer transport of the love of sight. Opening reception, on Thursday November 19, from 6-8pm. The Charles P. Sifton Gallery, Theodore Roosevelt U.S. Courthouse, 225 Cadman Plaza East, Brooklyn, New York. Opening reception, on Thursday November 19, from 5-7pm.